344 Commonwealth is located on the south side of Commonwealth, between Hereford and Massachusetts Avenue, with 342 Commonwealth to the east and 346 Commonwealth to the west. 344 Commonwealth was designed by Obed F. Smith, architect, and built in 1883-1884 by Vinal & Dodge, masons, for building contractor George Wheatland, Jr. for speculative sale. He is shown as the owner on the original building permit application, dated November 10, 1883. The house was originally numbered 342 Commonwealth until about 1889, when 328 Commonwealth was built and the houses to the west of it were renumbered. 344 Commonwealth was one of two houses (342-344 Commonwealth) designed in the same style, and one of thirteen houses (336-360 Commonwealth) built for George Wheatland, Jr., by Warren D. Vinal and Charles A. Dodge on land owned by Charles Merriam and by Jacob Rogers. 336 Commonwealth was designed by George Avery, 338-340 Commonwealth were designed by Bradlee, Winslow, and Wetherell, and 342-360 Commonwealth were designed by Obed F. Smith. 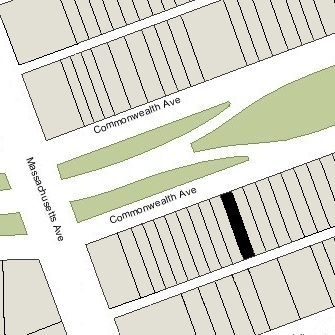 Click here for an index to the deeds for 344 Commonwealth, and click here for further information on the land on the south side of Commonwealth between Hereford and Massachusetts Avenue. On November 15, 1883, Jacob Rogers sold George Wheatland the land where 342-344 Commonwealth were built. On April 15, 1885, was purchased from George Wheatland, Jr., by Dr. James Henry Payne. He and his wife, Harriet Maria (Whittier) Payne, made it their home. He was a physician and also maintained his office there. They previously had lived (and he had maintained his office) at 1472 Washington. Their son, James H. Payne, Jr., also a physician, lived and maintained his office at 344 Commonwealth until June of 1898, when he entered the Navy. He became a career officer in the Naval Medical Corps. Their daughter, Blanche Payne, also lived with them. On December 12, 1907, James Payne transferred 344 Commonwealth to her. James Payne died in May of 1909 and Harriet Payne died in December of 1913. Blanche Payne moved soon thereafter and by 1920 was living at The Marlborough at 416 Marlborough. 344 Commonwealth was not listed in the 1915-1921 Blue Books. On June 26, 1917, 344 Commonwealth was acquired from Blanche Payne by Lester H. Stanley, who conveyed it on the same day by David Yuill, who then conveyed it on June 30, 1917 to Edwin Rich. Before taking title to the property, Edwin Rich had applied for (and subsequently received) permission to convert it from a single-family dwelling into two apartments. He appears to have abandoned this permit, and in July of 1917, he applied for (and subsequently received) permission to convert the property into a lodging house. On December 13, 1917, Catherine Eulalia (Moore) Condon, the widow of Michael J. Condon, foreclosed on a mortgage she held on 344 Commonwealth and took possession of the property. She lived in Knoxville, Tennessee. By 1920, the dental hospital at 344 Commonwealth was operated by Dr. Joseph Crandall Burrows, who also lived there. On May 28, 1921, 344 Commonwealth was acquired from Catherine Condon by her daughter, Elaclaire M. (Condon) Conley, the wife of John Joseph Conley. They lived in Newton. Joseph Burrows continued to live at 344 Commonwealth in 1923, but then moved to Hyde Park. He married in 1925 to Florence Gardner and they subsequently lived in Milton. He continued to maintain his office at 344 Commonwealth in 1925, but had moved it to 6 Beacon by 1926. On May 7, 1923, 344 Commonwealth was purchased from Elaclaire Conley by Mary (Roulstone) Ott, the wife of Dr. George J. Ott. He was a physician and also maintained his office there, They previously had lived (and he had maintained his medical office) at 407 Marlborough. The Otts converted the property into apartments and medical offices. 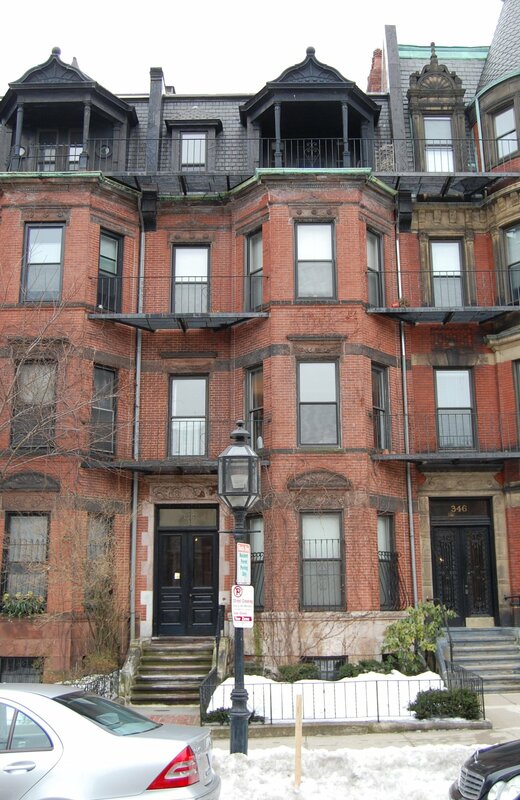 Also living at 344 Commonwealth by the 1924-1925 winter season were Sarah (Bowdoin) Lawrence, widow of Samuel C. Lawrence, and their two unmarried children, Harry Victor Lawrence and Miriam Phillips Lawrence. 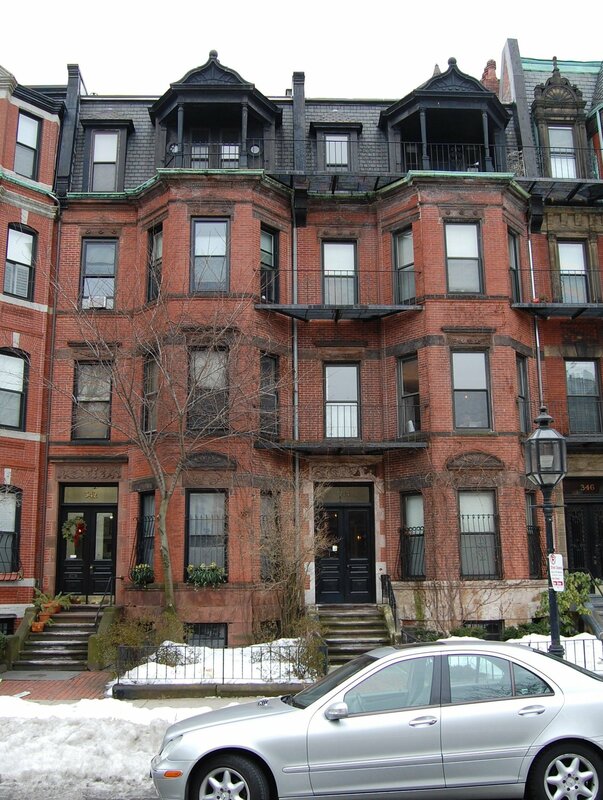 Sarah Lawrence died in May of 1925; Harry and Miriam Lawrence continued to live at 344 Commonwealth in 1937, but had moved to 1138 Boylston by 1938. In April of 1931, Mary R. Ott filed for (and subsequently received) permission to convert 344 Commonwealth into four apartments and an office. In the application, she indicated that the current occupancy was three apartments and an office. George Ott died in March of 1941. Mary Ott and their son, Lawson Roulstone Ott, continued to live at 344 Commonwealth until about 1944, when they moved to 394 Marlborough. On June 26, 1944, the Boston Penny Savings Bank foreclosed on a mortgage it held on 344 Commonwealth and took possession of the property. The property changed hands and on August 2, 1946, was acquired by John F. Olson, a machinist, and his wife, Hedvig A. (Mattson) Olson. They lived in one of the apartments. They previously had lived in Watertown. On April 18, 1950, 344 Commonwealth was acquired from the Olsons by Eliot J. Brody, and on June 1, 1950, 344 Commonwealth it was acquired from him by Albert Zimmerman. In December of 1950, he acquired 336 Commonwealth. On March 30, 1951, he transferred both properties to the Zimmerman Realty Corporation. In May of 1951, Albert Zimmerman filed for (and subsequently received) permission to legalize the occupancy of 344 Commonwealth as eight apartments, which he indicated was the occupancy when he purchased the property. On May 31, 1962, 336 Commonwealth and 344 Commonwealth were acquired from Zimmerman Realty by the Wendell Realty Corporation (Herbert Levin, president), and on May 18, 1964, they were acquired from Wendell Realty by Carmen Camacho. On April 18, 1967, 336 Commonwealth and 344 Commonwealth were acquired from Carmen Camacho by Jack Aifer. He already owned 328-330 Commonwealth and 334 Commonwealth. On May 4, 1967, Robert White acquired 344 Commonwealth and Jack Aifer’s other four houses on the block. He already owned 324–326 Commonwealth and 348 Commonwealth. By December of 1978, he owned 322–324–326–328–330–332–334–336 Commonwealth, 344-346-348–350 Commonwealth, and 354–356–358–360 Commonwealth. In December of 1988, he applied for (and subsequently received) permission to convert 344 Commonwealth from eight apartments into nine apartments. At the same time, he also applied for (and subsequently received) permission to combine it with 346, 348, and 350 Commonwealth into one property, to be known as 344-350 Commonwealth. In May of 1989, he filed for (and subsequently received) permission to increase the occupancy of the four buildings from 17 to 35 apartments. 344 Commonwealth remained an apartment house in 2018.